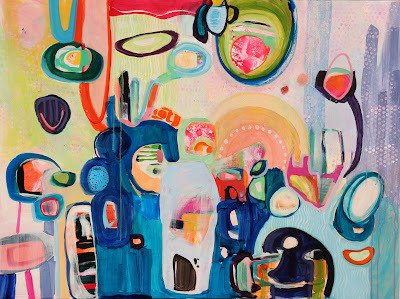 Eat Drink Paint • Kim Rempel: "Showtime"
In between my regular studio paintings I have been working on a new series celebrating nightlife and joie de vivre. I've been feeling fed up with the news, you know? Some days you feel like it's all darkness, drear and the same old business over and over again. It can wear a person down. So one day this fall I had had it and decided to push myself to celebrate lightness, fun and maybe even frivolity :) I've adopted a new colour palette and vibe for this collection, so while I will carry on with regular work I will be throwing these into the mix too. The first piece is "Showtime" and is acrylic on gallery wrapped canvas / 30"x40" / $1350. Beautiful. I couldn't agree with you more Kim. Sometimes it feels like the whole world is falling apart, but I am all for the joy. We artists have the power to change what people see! Good for you giving them the happy, joyous side of life, which all of us need more of!